The Ninth Guildford Banjo Jamboree, in the tiny town of Guildford in Central Victoria, is almost upon us. We are sure that this year’s Jamboree will be as enjoyable as the last eight, with loads of talented artists in concerts, workshops and the dance, and with jam sessions going night and day. The Jamboree aims to be a friendly, enjoyable and informative gathering of musicians and music lovers and we trust that all readers who are attending will stand by that ethos and ensure that everyone has a wonderful weekend. I know it is the highlight of the year, both for local people and for the many folks who travel from far and wide. Of course the Jamboree could not possibly happen in our little village without the generosity of the performers, MCs, dance musos and callers, sound crew, local businesses and organisations, committee of volunteers, and the volunteers who come to the party and offer some time to sit on doors or sell tickets or merchandise, or help with the 1001 other tasks necessary for the Jamboree to function. If you are coming from afar and would like to volunteer, please contact us via any of the contacts at the end of the newsletter. Old favourites such as the afternoon concerts, the four chalkboard concerts, the open-age and youth Pick-Off awards, the Saturday lunchtime Big Tree Parade and Photo, the Maree Murrell Memorial Saturdee Night Dance, the Sunday morning Gospel Singalong, the Instrument Makers Display at London House and Glen Bale’s Big Banjo will still be featured. Our special logo this year features and honours the Big Banjo. Final artwork came from the wonderful Irene Fitness, but a number of folks contributed ideas and time, including quite a deal of work from Ashley and Louisa Tracey. 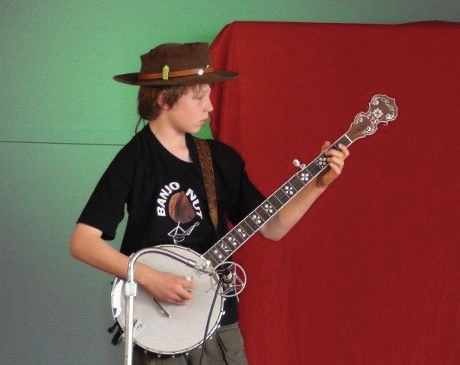 The Robbie Watts Pick-Off and the Ron de Graauw Youth Award during the Saturday afternoon concert will again see some fierce banjo pickin’ competition. Those interested in entering can do so at the Jamboree’s registration desk. Entrants must be Jamboree wristband holders. 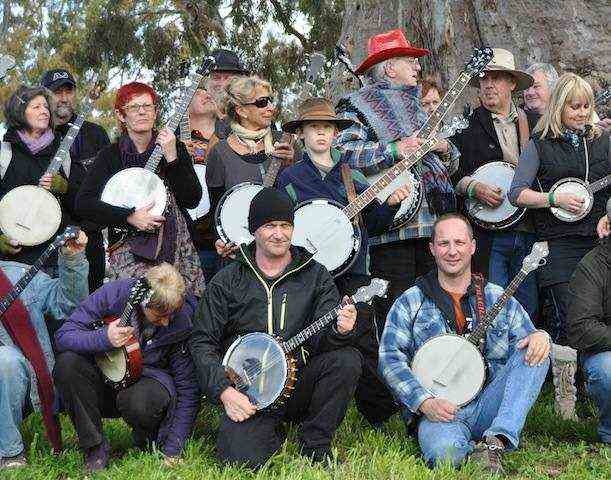 The Saturday afternoon concert in the Public Hall will feature: The Black Swans of Trespass, Red Dog, the Geelong Banjo Pickers, the Pick-Off awards, Appalachian Heaven, A new incarnation of Heel-Toe Express, The Kastlemaine Klezmer Kollective and Faux Grass. The Sunday afternoon in the hotel beer garden will feature: Zeptepi, Rose Turtle Ertler, Tequila Mockingbirds, Archer and the Long Gone Daddies, High and Lonesome, Sitting Ducks and the Cider House String Band. There will be four “chalkboard” concerts – Friday night, Saturday afternoon, Saturday night and Sunday afternoon. Register for these at reception at the Public Hall during the Jamboree if you wish to perform. Chalkboard performers must be Jamboree wristband holders. Most “chalkboard” concerts will commence with a band set. Friday night: Pennyweight; Saturday afternoon: The Marvilles; Saturday night: Lonesome Still; Sunday afternoon: Jan Wositzky. Saturday and Sunday morning workshops will be offered in many styles of banjo playing, from Bluegrass to Jazz, from Celtic to Klezmer! Organisers appreciate any assistance anyone can offer before, during and after the Jamboree. Anyone wishing to volunteer some time can contact the organisers at: volunteers@banjojamboree.org The full volunteer offer form is on the website. Further information can be obtained from our website at www.banjojamboree.org or by emailing info@banjojamboree.org or Ph 03 5473 4201. Here is a YouTube video sent to us from this year’s 2012 Guildford Jamboree in Victoria. 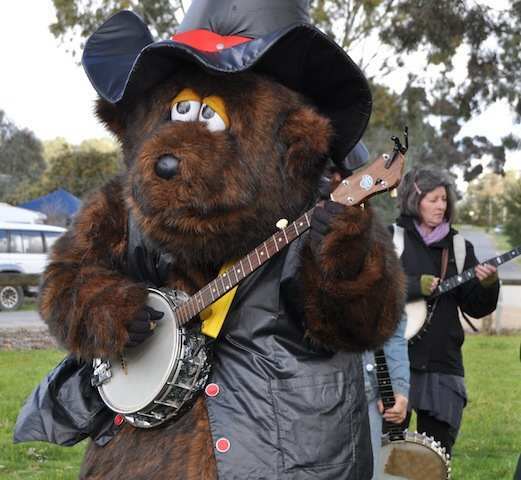 The Guildford Banjo Jamboree sees an eclectic gathering of musicians and music lovers in the small country town of Guildford, in Central Victoria, Australia. It was conceived in 2004 to showcase the banjo in its many forms and related styles. The emphasis has been on American string-band music (Bluegrass, Old-timey, Appalachian, Jugband, Hawaiian and Blues) but the programme also encompasses other styles such as Celtic, Klezmer, Jazz and contemporary music. The Guildford Banjo Jamboree in Central Victoria is a gathering of musicians and music lovers and scheduled for 21st to 23rd Sep. 2012. It was conceived in 2004 to showcase the banjo in its many forms and related styles. The emphasis has been on American string band music (Bluegrass, Old-timey, Appalachian, Jugband, Hawaiian and Blues) but the programme also encompasses other styles such as Celtic, Klezmer, Jazz and contemporary music. The Jamboree includes concerts, workshops, a dance, a parade, a Gospel sing-along, a banjo makers display, and many, many jam sessions. A great spirit of celebration has pervaded the town during each of the past eight Jamborees and, whether on stage or in the jam sessions, the music from an enormous array of instruments and voices has been top class. Of course the Banjo is always King – as well it should be! The Jamboree is organised and run by volunteers, and is hugely supported by the townsfolk of Guildford and surrounds. All our musicians, MCs and dance callers give their time and talents in return for a weekend pass and they work hard to make sure that the crowds get well and truly more than their money’s worth. The Jamboree owes much of its success to local residents, businesses and organisations. Each year a percentage of excess funds is donated back to organisations such as the CFA, the Hall, the John Powell Reserve and the Primary School. Organisers appreciate any assistance anyone can offer before, during and after the Jamboree. Anyone wishing to volunteer some time can contact them at: volunteers@banjojamboree.org The full volunteer offer form is on the Guildford Banjo Jamborre Website. Further information can be obtained from the website at www.banjojamboree.org or by emailing info@banjojamboree.org or phoning 03 5473 4201. The 8th Guildford Banjo Jamboree. The Guildford Banjo Jamboree is all about the most joyful of all musical instruments, the banjo. No less that 12 workshops were held, ranging from the banjo ukulele, banjo mandolin, Irish tenor to claw-hammer and bluegrass banjo. All workshops were well attended. The Saturday night bush dance in the public hall is always a great attraction, as are the blackboard concerts in the music hall. 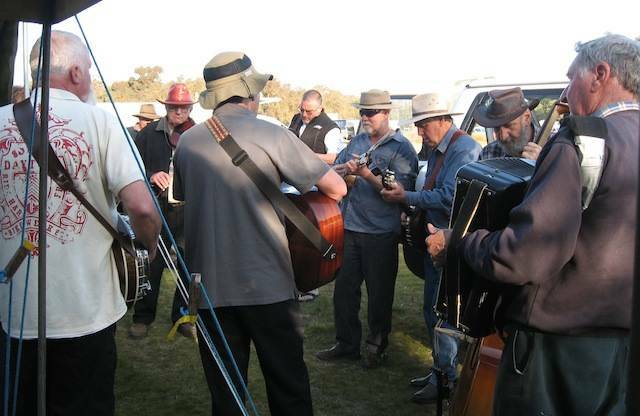 Victoria’s West Gippsland region was well represented at the Saturday night blackboard concert by the “Bunyip Bluegrass Jammers”. There were eleven of them on stage led by Steve Jackson and Robert Montgomery. 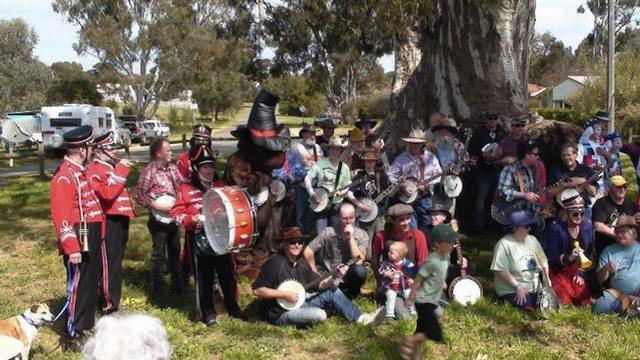 The mass banjo photo shoot under the big tree (a more than 500-year-old red river gum) was a sight to behold, with Mick Coates leading the charge with “Folsom Prison Blues”. The Robbie Watts banjo pick-off was also a big crowd-pleaser. The open award was won by Brayden Ryan with a blistering performance. At only 20 Brayden has now won the Robbie Watts award three times. For the first time an under 18 youth award was included as part of the Robbie Watts banjo pick-off. 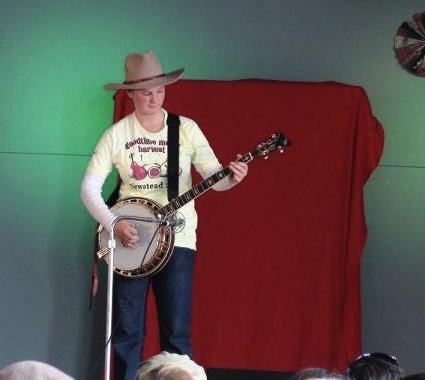 The Youth Award was won by Connor Young, an eleven year old with a passion for bluegrass banjo. The audience loved it. Congratulations Connor. The Sunday Gospel singing on the banks of the Lodden River with “Dancing with the Angels” led by Bruce Sedawie was one of the highlights of the festival. I would like to mention that the performers, MCs, dance callers etc. give their time for just a weekend pass and they still have performers clamoring to play. This creates a great atmosphere of sharing, with experienceed players sitting in the street jamming with the youngsters or those less experienced. The Guildford community is highly supportive of the annual Jamboree. In turn the community is helped each year with some festival funds for various projects. The addition this year of the new toilet and shower block was much appreciated by all. So to sum up the Guildford Banjo Jamboree 2011 was a huge success, blessed with glorious weather for the whole weekend. 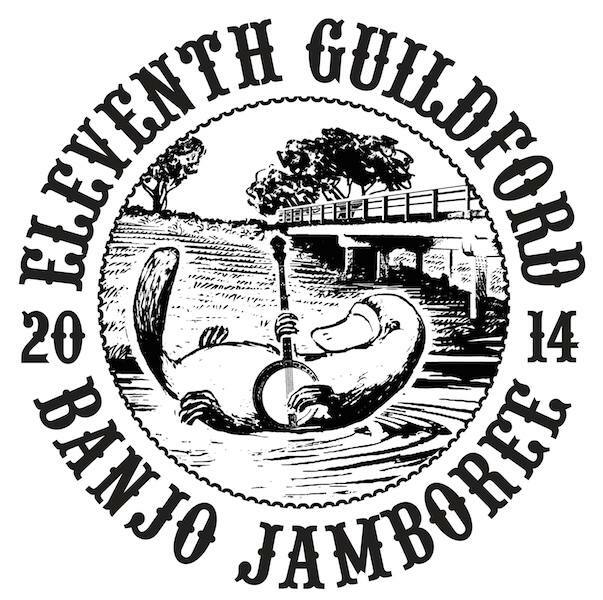 The 8th Guildford Banjo Jamboree is almost upon us. It’s held in the little village of Guildford, near Castlemaine in Central Victoria. Organisers are sure that this year’s Jamboree will be as enjoyable as the last seven, with loads of talented artists in concerts and workshops, jam sessions going night and day, a fantastic Saturday Night Dance and a Sunday morning Gospel singalongs. The Jamboree aims to be a friendly, enjoyable and informative gathering of musicians and music lovers. The weekend ticket price is only $30, which includes camping. Other ticket prices are on the Guildford Jamboree Website. No pre-bookings – just roll up and check in at the Public Hall. As well as the concerts and workshops, expect old favourites such as the Saturday Parade and Big Tree Photo, the Robbie Watts Pick-Off, the Saturday night Dance, the Sunday morning Gospel singalongs, the Instrument Makers Display at London House, and Glen Bale’s lit-up Big Banjo. Check the Guildford Jamboree Website for further details. Here’s some great news from the Guildford Banjo Jamboree. 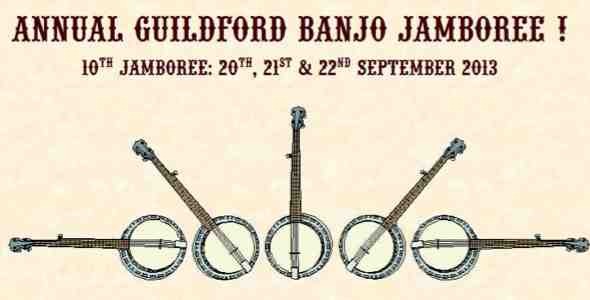 The new committee, comprising Jeanette Gillespie, Annie Wiltshire, Jasmine MacDonald and Ray Pattle, have advised us that the 7th Guildford Banjo Jamboree is definitely going ahead in 2010. The new committeeÂ is keen to carry on the tradition in the spirit of that which has been established. The Ryan brothers and others previously involved will be valued advisors as we take over the big task. The website will be updated within the next couple of weeks and then progressively as time goes on. The famed Guildford Banjo Jamboree has added a useful bulletin board to its website. The bulletin announces a range of new and revised initiatives from new blackboard concerts, canceled concerts and calls for workshop facilitators. The site also has some last minute tips on camping spots. Well worth a read before you head of the the festival next weekend.